A Children's Book with an Environmental Message - BUY NOW!!! 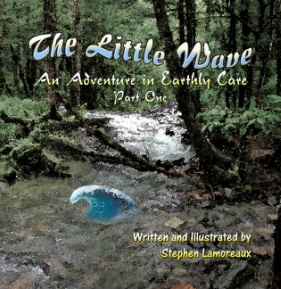 The Little Wave is a beautifully illustrated environmental children's story, written in rhyme. Kids between the ages of 4 [read to] and 10 [read themselves] will find engaging, entertaining and educational. The lack of appreciation and disrespect for our planet has become front-page news regarding global warming, clean water shortages, garbage accumulation, depletion of natural resources, etc. Human behavior must change if we are to continue to inhabit the Earth well into the future. Click on the cover image to view a short video about the book. Noble.com, as well as in Kindle, Nook and other eBook formats.